Molly Peacock’s How to Read a Poem . 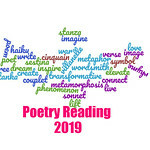 . . and Start a Poetry Circle provides a great deal of information in just 200 pages–from how to interpret poems to how to create a poetry circle and join the ranks of those dipping their feet into the poetic pool. Peacock clearly knows her stuff from writing verse to examining its structure and images. She postulates that any poem can be examined in three simple steps. Examine the poem line-by-line, which she notes is considered the skeleton of the poem. Examine the sentence, which readers could consider the muscles of the poem. Finally, readers should examine the image or nervous system of the poem. However, Peacock does not suggest that readers pick apart each element of a poem and discuss it ad nauseam. A number of chapters examine a number of poems, their images, their rhythms, and their internal music. 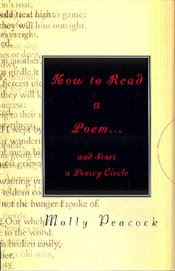 Beyond the application of these techniques on actual poems, Peacock illustrates the beauty of poetry circles, how to start poetry circles, and provides readers with resources to begin their own poetry circles and how to select poetry for discussion in these circles. These groups are not like book clubs where copious notes should be taken and entire books should be read. The purpose of a poetry circle is to generate a mutual respect and joy for each line of verse. After reading this book, I’m going to try an experiment. I want to create a virtual poetry circle. I’ll post a new poem each week for people to read and comment about what they enjoyed about a line, a stanza, or the entire poem. Comments can range from what is good about a poem to what readers don’t like about a poem. Share your thoughts, opinions, and vision of the poet’s work. I’ll probably post these each Friday or Saturday, so keep an eye out. This is my 1st book for the poetry review challenge.